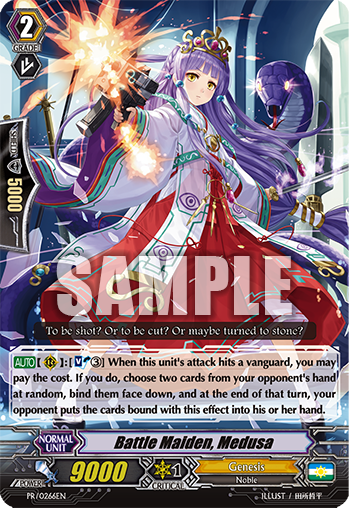 Today’s “Card of the Day” features a medusa that isn’t waiting for you to use the mirror trick. [AUTO](RC):[Soul-Blast 3] When this unit’s attack its a vanguard, you may pay the cost. If you do, choose two cards from your opponent’s hand at random, bind them face down, and at the end of that turn, your opponent puts the cards bound with this effect into his or her hand. The set line-up has been put up for the English card game. Note: No Touken Ranbu yet and both Character Booster in March. And the Revival Collection product page has been put up. It includes the featured clans (not all are featured) and the featured archtypes for new support.